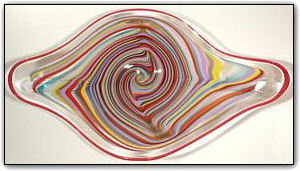 This amazing very large hand blown glass platter has shades of red, blue, purple, aquamarine, yellow and more. The pattern was created with glass canes of brightly colored glass. Working with canes is a time consuming two-stage process. First Dirwood had to hand pull the canes used to make this platter, then he made the bowl using those canes. There are also three lip wraps, another very complex and time consuming process. One is a wide band of clear, then red band, then a narrow clear band. The platter will hang on your wall - just like a picture - all you need is a secure picture hook. Or you can use it as a low table platter. Make sure to zoom in to see the details up close, this is such an elegant platter!